USDA recommends people visit www.choosemyplate.gov/StartSimple to get started with tips on the MyPlate food groups, or to use a variety of simple resources to put these tips into action. 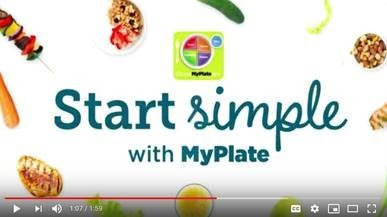 Online resources include the MyPlate Plan and widget, a tip sheet, the MyPlate Action Guide, a one-week menu template, as well as a toolkit for nutrition professionals. Join USDA to celebrate the different ways people strive to eat healthy and Start Simple with MyPlate! View more information about the challenge here: www.choosemyplate.gov/StartSimpleChallenge. Tell our sponsors you saw them here! It was the July 4th weekend in 1974 and my “Beautiful Betty” wife and I were in Jamaica for the first time celebrating our twenty fifth Wedding anniversary with our Cuban DR. and his Scottish wife who were regulars in Ocho Ros Jamaica. It was there that we met “Momma Mia” and her families who welcomed us into what they called the “JULY” club. They all hailed from New Jersey and New York and some American Jamaica residents. We had just buried my Father, with funerals in California and final interment in Indiana. Whether it was all the stress of this or not, my wife came down with Phlebitis and If it hadn’t been for our Dr. going to Jamaica with us she we would not have gone. She always never let illness keep her down and she turned out to be a star attraction with the “natives” who refered to her as the “Lady with the sick leg” and carried her to and from the beach and made sure her “rum” punch glass never ran dry, with snacks and meals galore. Not to be denied, she was up and starring on the dance floor 3 nights after we arrived, bandaged leg and ALL!! This is the same “LOVELY” lady who, at 5ft tall & 100lbs. delivered FIVE bouncing BOYS in a span of 9 years. The “original” Momma Mia dubbed Betty “Momma Mia” 2 and their friendship was sealed. We, and all our boys and their families continued our visits to Jamaica for 10 years until political insurrections made it too dangerous. The “Momma Mia” title stuck and OUR “Beautiful Betty” took her “title” with her when she died at age 86 yrs. In June of 2015. GOD BLESS!!! ALL MOTHERS!!! My “MOTHER”, Born 1906—Died 1969, orphaned when she was 10 years old and she & 2 younger brothers put in an orphan’s home until warded out when she was 16. Although I didn’t know IT, she really was MY “Momma Mia”, sans the “July Club” and Jamaica. Get your brand name recognized, just like Fuccillo Kia and Stanley Steemer by advertising regularly, and get your message seen by more readers than any Hendry or Glades county, and save 50% or more compared to their advertising rates and readership. Call (863) 800-0010 or email for best rates too on Southwest Florida Online as low as $25 per full-color insertion of any size ad that fits the page! See More Daily Local News Stories on the Sunday Morning News/Southwest Florida Online News Blog pages: http:/swflorida.blogspot.com with a searchable index for photos, videos, and archives of all stories published online since May, 2004 and millions of online views. LABELLE, FL. -- Looking for a Sunday Morning News internet page from a decage ago? You can find many archived web pages from the past at the "Way Back Machine", a feature of Archive.org, keeping for posterity webpages from the past. The Sunday Morning News is archived as far back at February 1999, and includes over 100 weekly editions of the Hendry and Glades area news pages. Most of the important editions of the Sunday Morning News/Southwest Florida Online pages can be found at the archive. LABELLE, FL. -- Don Browne has been publicizing LaBelle and Hendry-Glades county for over 14 years though his Southwest Florida Online web pages featuring news and information about the Hendry-Glades-Lake Okeechobee region. A live web camera page has added a new twist to social networking while promoting the Hendry county area. In mid-November 2007 through 2010 the live video cast began to spread the word around the world about Southwest Florida, and the LaBelle/Hendry/Glades county area. In February 2009 a 3-D video camera was added. A "featured producer" on the former Justin.TV, Don broadcast primarily on the weekends and his broadcast page had 10,000 to 20,000 viewers pass through each hour that he was broadcasting live. In October 2010, over 1,000,000 new viewers visited LaBelle online. LaBelle's "lifecasting" video page attracted viewers from all around the world, even a surprise visit from a French man who was climbing Mournt Everest, the world's highest mountain. A map on the webcast's page showed from where the visitors were coming. Today, newer technology has arrived for live webcam broadcasting including Google's "Hangouts On The Air" which incorporates live YouTube broadcasting. Don has been making live webcast in recent months with up to 10 simultaneous webcasters broadcasting live on his YouTube channel. One of the test broadcasts from 2012 is a 4 hour long YouTube Live broadcasts with 10 people. Place your classified ad in the Sunday Morning News/Southwest Florida Online. Monthly Rates: $1 per word ($15 minimum please) and your ad runs 24/7 online on the Classified Ad Page for 30 days. Send your classified ad to us by email, and pay securely online by credit card, debit card or check by either PayPal or Amazon. 8 Port LaBelle Quarter-Acre Residential Lots - In sections 1 through 12, excellent location in west Hendry County in largest subdivision in county. Sell or trade. Call (863) 800-0010. For Sale .15 Acre on State Road 80 east of Pioneer between LaBelle and Clewiston. Last of Joe B. Hendry's personal land holdings who held this lot since 1949. Lot is located just north of SR80 across from Everhigh Acres Rd on the Hilliard Canal. SR80 will be four-laned here in the next few years. Email.